Vern Burkhardt (VB): In The Innovator's DNA, you deliver the optimistic message that 2/3rds of our innovation skills are learned and yet some innovators are legendary and stand out from all others. Why is this the case? Hal Gregersen: Lots of people like heroes that they think that they can never become. The reality is that most innovation heroes live lives just like you and me, but what they do every day of their lives often looks a bit different. Take a simple situation like Steve Jobs. Obviously there are things that are not replicable about Steve Jobs. There’s a piece of him that was just him. But if you look at how he spent his time, he was like any other innovative CEO or founder of a company. They spend roughly 4 months of their waking hours in any given year actively seeking new ideas. For leaders in their mid-50’s, like Steve Jobs was when he passed away, they would have spent at least 17-18 years of their lives focused on getting great ideas versus a non-innovative CEO at a less than innovative company who spends about half that time—which is what our data showed. Put simply, innovation heroes, like anyone else who has mastered their art or craft, be it sports, music, or business, have spent hundreds if not thousands of hours, adding up to days and years of their lives, doing things that make them better at disruptive innovation. VB: You say, "a critical insight from our research is that one's ability to generate innovative ideas is not merely a function of the mind, but also a function of behaviors… if we change our behaviors, we can improve our creative impact." Would you talk a bit about this? Hal Gregersen: During our research we talked with Jeff Bezos at Amazon.com. Ever since he was a young boy he has always been curious about the world just like any other young boy, but he happened to have adults around him who said, “It’s kind of cool to have kids keep their innovative skills.” Jeff Bezos visited his grandparents’ at their farm in the summertime and got deeply reinforced that experimentation will solve pretty much any problem you face in the world. If you try enough different angles at a situation, one of them is going to work at some point. So that’s what these skills are. They’re habits for innovators that are perhaps skills for the rest of us. If we practice hard enough they become habits and they do make a difference. VB: "Our analysis found that the best predictor of excellent associating skills was how often people engaged in the other discovery skills – questioning, observing, networking, and experimenting." Would you talk about this? Hal Gregersen: The classic advertising campaign, “Think Different” is absolutely inspiring and, even now almost two decades later, it’s great to hear and listen to that advertising campaign admonishing us to think differently. However, it’s a bit incomplete. What we’ve found is to think differently people have to act differently. Those actions are concrete skills. We challenge the world with our questions. We ask questions that take on the status quo. We observe the world like anthropologists, paying attention to the details. We network, not for getting resources or getting ahead, but to get great ideas. And we experiment, experiment, and experiment until we figure out a way to make something work. Experimenting is the best technique for generating data on what might work in the future. There are three types of experimenting which generate data and spark new insights. These include try out new experiences, take things apart, and test ideas by creating prototypes and pilots. Questioning, observing, and networking are excellent for generating data about the past and present. By asking great questions, observing salient situations, and talking to the right people you will most likely need fewer experiments. When people act differently by questioning, observing, networking for ideas, and experimenting, and then when they’re pushed into a corner where they have to think associationally, connect the unconnected, they will have a much higher probability of getting great idea to solve a problem. VB: You provide 5 tips for developing associating skills. Is one of these your favorite for stimulating different thinking and weaving together unexpected connections across ideas? Hal Gregersen: My favorite may not be your favorite because the things we rely on to get new ideas depend to some degree upon how we learn. I love to learn by touching, feeling, and moving things, so personally I collect all kinds of items from every corner of the Earth. If I’m in Brussels I’ll go to the flea market. Recently I found a horse halter with blinders on it. I put it in my office and at some point when I’m trying to tackle a problem, I might think about how my problem relates to this horse halter with blinders on. I get surprised every once in a while with a great new idea. VB: Does this mean you like to build your own curiosity box? Hal Gregersen: Exactly. For me it's things. For other people it might be great quotes. It might be pictures. It might be images. Hal Gregersen: It’s a powerful mechanism for building our questioning capability. For example, I was working with the senior team of Coca-Cola--basically it was the Euro-Asia-Africa region of Coca-Cola covering about 90 countries from Russia down to the tip of South Africa. We were working with the president and the senior team of that region to solve a significant problem. They didn’t have a solution and we engaged in QuestionStorming. QuestionStorming is getting a group of people — 5 or 6 folks — and putting them around a flip chart. One person becomes the scribe. If we have a problem we care about we spend the next 15 minutes until we get at least 50 questions about that issue. Actually 75 questions is an even better target. The questions might be why the problem exists or how we might solve it, but we speak in question talk. We don’t make statements. We don’t have exclamation points. It’s nothing but questions. When people do this, by the time they get a list of 75 questions it’s almost impossible to not get a new view on a perplexing and vexing problem. Those new questions are the doors which open up to new answers. That’s what it comes down to. If we want to change the answers to the problems facing us, we have to change the questions we’re asking about them. VB: And this becomes part of the core of an innovator's DNA? Hal Gregersen: Absolutely it does. VB: "Most innovators are intense observers." How can one learn this skill? Hal Gregersen: The first thing we found is these skills are most powerfully learned when people have an innovation project or challenge they are trying to work on. It might be a personal issue in a relationship they’re trying to figure out. It might be a political issue. It might be a practical challenge such as increasing efficiency in one part of the factory floor by 5%. Whatever the problem the next step becomes what could we watch carefully in order to get some new insights about this problem. It might be watching the people working with the machines in the factory plant. It might be going to a different factory and watching how other people run their machines. It’s a matter of identifying places to make observations, and then setting aside the time to do it. VB: Do you have to make notes of what you are seeing? Hal Gregersen: Absolutely. Some of the best observers love to take pictures, videos, or notes. Sometimes all of the above. They’re trying to capture different angles of the situation. Sometimes pictures, notes, or videos will illuminate things we didn’t see the first time around. Scott Cook at Intuit founded the company which makes QuickBooks and Quicken. He asks a perfect question of himself and other people and they make observations. Basically the question is you’ve done your homework, gone out, made observations, come back, and asked yourself, “What was surprising or unexpected as you watched those people or that situation?” If you come up with blank answers to those two questions, you have to “rewind the tapes, go back to the situation, and look again.” There is always the opportunity to see something differently. VB: Is it the surprise element that helps us with creativity? Hal Gregersen: That’s exactly right. All of these skills are trying to help us see beneath the surface of the situation. For the most part the fact that any of us have a problem for which we don’t have a solution means we haven’t looked deeply enough. VB: Developing and retaining a highly diverse network of people takes a lot of time and effort. Did the innovative leaders you interviewed find it was worth the effort? Hal Gregersen: Absolutely. If you were to follow Richard Branson, founder of Virgin Companies, anywhere around the world he has a knack for talking to anybody. It may sound like a big labor but it comes down to opening up our conversations to people who don’t look, think, or talk like us. The moment this happens, and we try to share with them some challenge or issue, we get some really surprising insights. Disruptive innovators like Branson do this naturally. But for the rest of us, and especially if we don’t necessarily feel comfortable talking with new people, it might be as simple as setting up two lunches a month, one every other week, with somebody who is on a different floor of the organization we work in. Or talking with someone who comes from a different country than the one we’re from. Or works in a different industry. It's not only going to lunch with somebody; it's going to lunch with somebody who is different. VB: We tend to think CEOs only meet with other senior executives, but I gather you found they meet with people who have a widely diverse range of backgrounds. Hal Gregersen: Innovative CEO’s do. CEO’s who don’t are running companies which are likely at some point to run right into the ground. Mark Benioff founded Salesforce.com, one of the most innovative companies in the world. The markets value their innovation. They believe they’ve got a future. We have an analysis called ‘The Innovation Premium’ which tells us how much investors are willing to pay extra for a stock because they think, ‘They’re going to do something different in the future.’ Well, Benioff is not that old but he’s not that young either, and he intentionally talks with really young people to obtain new ideas for his business. That’s part of what helped him and his team at Salesforce.com build the incredible product called ‘Chatter.com’. It is kind of a mixture of Facebook and Twitter, but it works exceptionally well within businesses. VB: "Our research on innovators revealed that one of the most powerful experiments innovators can try out is living and working in different cultures." Why is this so? Hal Gregersen: Because the essence of getting new ideas is living at the intersection of at least two ways of looking at the world. What I mean is if I’ve grown up in France and somebody else has grown up in the United States, we will see the world differently. Great ideas come from the friction between two different world-views. This is why, when people live in different countries or grow up in bi-cultural families with parents from two different countries, statistically the odds are in their favor that they’re going to get greater and newer ideas than somebody who hasn’t had this upbringing. VB: Do you have any other advice about how to master the five skills of disruptive innovators? Hal Gregersen: Step back. Look carefully at your own situation. Think about a problem that matters to you. And then decide what you can do in the next 30 days to make a difference about that problem. I would start with QuestionStorming. It’s as simple as spending 4 minutes a day every day of the week writing down nothing but questions. Four minutes goes really fast. If somebody does this for 30 days they will get some insights into their problem. The other thing we discovered is not everybody has to observe, network, and experiment to get great, new ideas. Some of us love to observe. We watch the world. Others love to network. They’re the talkers. The experimenters love to do things, to try new things, and to touch things. We found that we don’t have to be everything to be disruptive. If somebody loves to just be an observer, then observe and figure out different ways of looking at your problem. This is where the DNA comes into it. Discovering New Associations (DNA) comes from knowing our strengths as innovators and leveraging them rather than trying to be like somebody else. VB: You surveyed a large number of innovators and executives in more than 75 countries. Did it change your approach to your consulting work on innovation, globalization, and transformation? Hal Gregersen: We interviewed about 200 disruptive innovators, and surveyed about 500 entrepreneurs and people who generated new ideas as well as 5000 other executives and professionals. As I look back on the terrain of all those conversations, probably the most profound influence on my own work is the deep belief and reminder that innovation is a choice. If we wake up in the morning and decide to figure out a new solution to a problem which is important to the world, we can do it. The second thing is these are skills. It’s not enough to just talk to other people about using these skills. I regularly find myself relying on them to try to work my own way through a consulting or teaching challenge, or even trying to set up a new business challenge. VB: This was a significant learning experience for you personally? I guess the other significant learning piece for me personally is I was surprised that almost all of these innovators at some point, whether they were children or adults, had somebody who paid attention to them as innovators and valued it. When I’m giving speeches about this study it’s often my final note because it is so profound. If there is any single, impactful message resulting from the study it’s that we can act a little differently because of it, especially with those we love the most. When we deal with our children or grandchildren, one of the greatest gifts we can give them is simply paying attention when they ask tough questions, hearing their observations about the world, encouraging them to talk to very different people, and not getting too uptight about their experiments when they try new stuff. It’s nurturing the next generation, which will solve the world’s problems, that all of us are walking into. And they are solvable if we put these skills to work. VB: And there are many problems. Hal Gregersen: There are. I fundamentally believe that if we nurture these skills within ourselves, and then look outside of ourselves and nurture them in others —particularly the younger generation — we can tackle this stuff. VB: Do you have any advice for entrepreneurs who wish to implement a disruptive innovation and need their employees to make it happen? Hal Gregersen: It's not all about you, Mr., Miss, or Ms. Entrepreneur. Entrepreneurs are usually great at getting good ideas – at least the disruptive ones – but building a disruptive business model is more than one idea. It’s usually hundreds if not thousands of ideas. It takes years, not days. And it takes a lot of other people in the game. From my perspective disruptive innovation is a team sport, not an individual one. Every one of these disruptive innovators relied on a lot of other people, and they honored and respected those other people and what they brought to the table. It was the collection which built these businesses and changed the world we live in. VB: "Our research shows that the DNA of innovative organizations mirrors the DNA of innovative individuals." Is this one of the secrets to success? Hal Gregersen: It is under two conditions. Number one is that the founder of a company actually has innovated themselves. Roughly 15% of all entrepreneurs are actually innovators. The rest are copycats. They may be considered an entrepreneur but they’re basically setting up a McDonald’s franchise. The ones who are getting the great ideas are basically doing it themselves. The ones who build an organization that is sustainable imprint innovation, value it, and make it part of the fabric and culture of the company. VB: Can a copycat be successful as an entrepreneur? VB: Would you tell us about your < href=http://innovatorsdna.com/innovators-assessments/ target=_blank>Innovator's DNA self and 360 assessments, and who would benefit from this assessment process? Hal Gregersen: These are assessments built around our interviews and surveys of roughly 6000 people. What the assessments do is give people a customized version of their innovator’s DNA. In other words, where are your strengths in terms of questioning, observing, networking, experimenting, and associational thinking, and how could you potentially improve them. It gives a person a fingerprint of their skills, identifies their strengths, and then helps them figure out how they could apply these to a specific problem. By summer of this year we will have a really exciting application for iPads and other tablet computers. The application will enable data from the assessment to be fed into an application that would coach participants as they try to solve their problems. It will help them to leverage their signature strengths as innovators, and to really do something with these strengths. VB: And the assessments will be available online? Hal Gregersen: The assessments are available online now through innovatorsdna.com, and the application we're in process of developing will also be available online. VB: Would you talk about your final call for action in The Innovator's DNA: "Adopt a young innovator!"? Hal Gregersen: It hearkens back to my earlier comment. All of us have children, grandchildren, neighbor’s children, and communities with schools full of children. I’m going to end with the notion of Steve Jobs that we started with. He said when he was a teenager if it weren’t for a few adults in his life who paid attention to him he would either be in jail or dead. And it’s true. When he was a little kid he had a father who gave him a workbench and said, “Explore things.” He had a neighbor from Hewlett-Packard who paid attention to the kids in his neighborhood. For those who showed an interest in electronics he taught them how things worked and helped them build electronic gadgets. While a teenager Steve Jobs had a teacher who paid him money to stay in school when he was ready to give up on the whole enterprise. If adults had not adopted Steve Jobs and paid attention to his innovation skills, we would not have had him as the innovator we knew. The same could be said for almost every one of the innovators that we interviewed who were disruptive. VB: This speaks strongly about the importance of parents and teachers. Hal Gregersen: Absolutely. Teachers, parents, uncles, and aunts — you name it. They make a difference. VB: You have indicated your next project will be related to how the Innovator's DNA skills can be used to solve the toughest social problems and make a difference in the world. What are you planning? Hal Gregersen: I’m in the midst of two initiatives. One is called, “the424project.” We’re trying to get everybody in the world to spend 4 minutes a day, which adds up to 24 hours in a year, where they’re writing down questions about problems which matter to them, their community, their organization, their country, or the world. My assumption is if more people will think carefully about the questions they’re asking, they’ll get better answers to the problems we’re facing. I used to be a professional photographer. I love art and photography. For the second initiative we’re working to build a network of artists from around the world who will use their skills to change the world in a positive way. It includes visual as well as performing artists. One is a group called Handspring Puppet Company led by Basil Jones and Adrian Kohler in Cape Town, South Africa. Not only does the puppet production called ‘War Horse’ appear at national theatres in Europe and on Broadway, they engage all kinds of youth in South Africa teaching them puppetry skills and, through this, to bridge deep ethnic and community divides. It’s powerful to watch the way these artists use their innovators DNA skills to help change the communities they live in. It’s incredible. VB: How will the large number of questions in the 4/24 project be shared with world leaders and world thinkers? Hal Gregersen: Two ways. We’re in the process of building a web site to launch the424project. We intend to create communities of questioners around the problems which they care about. Another way is in concert with TedX (the ted.com talks) where interesting, creative people come to learn about fascinating things and see the world differently. We’ve been working with some of the TedEx events that are held around the world. We’ve been collecting questions before people attend those events to collect information about what are the things these people care about. The intent is to use the event as a mechanism to change their questions. VB: Would you tell us about INSEAD's Learning to Lead Programme? Hal Gregersen: The Learning to Lead Programme is part of my work at INSEAD, which is a global business school founded in France and with campuses also in Singapore and Abu Dhabi. I love to work with CEO’s who run companies and first time managers who are starting their careers as leaders. Learning to Lead is a challenge for people who have moved out of a professional, independent contributor space; say being a successful engineer or lawyer, and becoming leaders of other engineers and lawyers. One of the greatest gifts we try to give them in this programme is focusing on their innovation skills. This is so that when they start their leadership journey they start it on the right foot. They build innovation skills and leverage them from the beginning. It will help them become better senior leaders in the future. VB: I presume the programme teaches people how to be discoverers rather than deliverers? Hal Gregersen: It’s both. Discovery and delivery both matter. It matters to get great new ideas, but it also matters to deliver them. How do we motivate and develop the capacity of other people to deliver that new idea, and how do we follow through and master skills and capabilities so it actually happens? The best innovators in the world value completely the best executors — the delivery driven people on the other side of the fence. They have to work together to make it happen. VB: Is this programme making a difference in our world? Hal Gregersen: I think it is in the sense that every one of these people manages 6 to 10 folks in the companies they work in. When they leave INSEAD’s Learning to Lead program, they go back as slightly better leaders than they were before. My hope is that they also inspire some of the people they work with to get some great new ideas and start businesses themselves. VB: Why are INSEAD's campuses located in Singapore and Abu Dhabi, in addition to the one in Fontainebleau, France? Hal Gregersen: Our vision is to be the Business School for the World, and with those three campuses we’ve created great launching points to the very vibrant, dynamic economies in the world. VB: Do you have any final advice about the skills needed to be a disruptive innovator? Hal Gregersen: Flip the switch if you haven’t already done so. The first step to becoming an innovator is being able to say to yourself, “I can.” The second part is innovation is a choice and, if we choose to spend our time engaging these Innovator’s DNA skills to solve problems that matter to us, we will solve those problems. VB: I gather you are fundamentally optimistic? Hal Gregersen: Absolutely, I am on this point. These are learnable skills. A recent study was done with people between 61 and 84 years of age. They were trying to teach them how to think differently, how to associationally think more effectively. Even at that age folks were learning these skills and getting much better at it, and living longer lives because of it. Anybody can learn associating, questioning, observing, networking, and experimenting skills if they decide to. VB: As you say in The Innovator's DNA, you can turbo charge your innovation results if you combine questioning with these other discovery behaviors. Hal Gregersen: It is so true. This enables individuals and therefore their organizations to think and act differently and thereby generate inventive ideas for new products, services, processes, and even businesses. This fall the authors will use measures in the Innovator's DNA Skill Assessment to develop Forbes' 2012 Most Innovative Companies ranking. Through the application of their principles and measurements, the list will shed light on companies at the forefront of innovation and change. The assessment includes Discovery Skills (Associational Thinking, Questioning, Observing, Experimenting, Networking, Challenging the Status Quo, and Risk Taking), Delivery Skills (Analyzing, Planning, Detail Oriented, and Self Disciplined), and Leading Innovation Skills (Encourages Associational Thinking, Encourages Questioning, Encourages Observing, Encourages Experimenting, Encourages Networking, Encourages Challenging and Status Quo, and Encourages Risk Taking). Dr. Hal Gregersen is a Senior Affiliate Professor of Leadership at INSEAD where he pursues his vocation of executive teaching, coaching, consulting, and research by exploring how leaders in business, government, and society discover provocative new ideas, develop the human and organizational capacity to realize those ideas, and ultimately deliver positive, powerful results. Before joining INSEAD, he taught at the London Business School, Tuck School–Dartmouth College, Helsinki School of Economics, Fletcher School of Law and Diplomacy–Tufts University, Brigham Young University, Thunderbird, and Turku School of Economics as a Fulbright Fellow. In 1981 he received a Bachelor of Arts in Management from the University of Utah, in 1983 he completed his Master of Arts in Organizational Behavior at Brigham Young University, and in 1989 he received a Ph.D. in Business Administration from the University of California, Irvine. Putting his research on leading innovation and change to practice, Hal Gregersen regularly delivers ideas with impact as he consults with senior teams, conducts executive seminars, and delivers keynote speeches on these issues with major companies. He also works extensively with governments, not-for-profit and NGO organizations to generate greater innovation and change capabilities in the rising generation of leaders, particularly young women leaders. 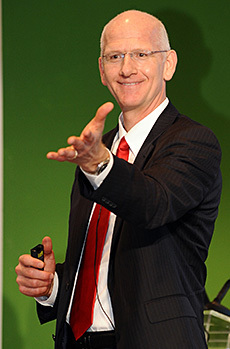 Hal Gregersen has co-authored numerous books, including It Starts With One: Changing Individuals Changes Organizations (2008) and Global Explorers: The Next Generation of Leaders (1999). He has published over 50 articles, book chapters, and cases on innovation and change in business journals such as Harvard Business Review, Sloan Management Review, Academy of Management Journal, Strategic Entrepreneurship Journal, and Journal of International Business Studies. His research has been highlighted globally in the media such as Across the Board, Business Week, Chief Executive Magazine, CNBC, CNN, Fast Company Magazine, Forbes, Fortune, Psychology Today, and The Wall Street Journal. He has received several awards for researching and teaching excellence, including the 2009 McKinsey Award runner-up for the best article in Harvard Business Review and the Ascendant Scholar Award from the Western Academy of Management. Hal Gregersen's newest book, The Innovator's DNA: Mastering the Five Skills of Disruptive Innovators (2011) flows from a path-breaking international research project conducted with Jeff Dyer (Wharton/BYU) and Clayton Christensen (Harvard Business School). The eight-year study explored the fundamental question of where disruptive innovations come from and what roles senior executives, managers, and employees play in the creation of highly innovative teams and organizations. They identified the 100 most innovative companies in the world (based on innovation premium calculations conducted with HOLT at Credit Suisse and published by Forbes) and interviewed their founder entrepreneurs and current CEOs. They also conducted over 5000 Innovator's DNA survey assessments (self and 360) of high performing entrepreneurs, managers, and inventors to understand how innovation skills produce new products, services, processes, and businesses. The Chartered Management Institute in association with the British Library named The Innovator's DNA as the best book of 2011 on the topics of innovation and entrepreneurship. Hal Gregersen is now actively exploring how the same Innovator's DNA skills can fuel social entrepreneurial success worldwide and how parents and teachers can foster the Innovator's DNA in the next generation of disruptive entrepreneurs.